Yours, Mine, and Ours is not great. In fact, after watching a handful of clips from the original 1968 film starring Lucille Ball and Henry Fonda, it’s clear that that movie is superior to this slapdash effort featuring Rene Russo and Randy Quaid. The story is about a blended family with a boatload of kids as well as a few dogs and cats and a pig. No one gets along, and someone is always screaming or throwing something or generally making a mess. Still, I chose to keep watching while eating Saturday leftovers when given the chance to change the channel, so I guess this means I liked it? If there’s one thing that kept me watching, it was Russo and Quaid. They lack chemistry surprisingly but make an attractive double act nonetheless. Both are magnetic and can turn me on with a smile, which is helpful since the script doesn’t leave much in the way of character development or romance. Helen North (Russo) is the kind of hippie mom who encourages creativity and group hugs amongst her ten children, some of whom are adopted. Her new husband and high school boyfriend, Frank Beardsley (Quaid), is the opposite, a pre-Maria Captain Von Trapp if you will. The Coast Guard admiral orders his eight kids to stand at attention and draws up bathroom charts for orderly use of the facilities. Despite being the actual adults in the room, they have little control over their kids and are mere observers to the chaos their bickering offspring create. They occasionally yell for the madness to stop, but the movie depends on anarchy. Without extended sequences of sibling sabotage and that scene where they turn their gorgeous lighthouse home with the 200-year-old banister into a Jackson Pollack work, the movie has little to go on. The novelty of an eighteen-child household gets old after awhile, and the writers don’t have a plan for what to do when things slow down. Helen has an interesting job as a designer, but that barely comes into play. We catch just one small glimpse of how it affects her relationship with Frank before it’s tucked away. Frank gets the better end of the deal, and his reluctance to take on a promotion with the Coast Guard makes a bigger impact. It’s done in such a hurried way though that it feels like they’ve only skimmed the surface. The momentum in this narrative lies with the kids, whether they’re fighting each other or, after changing tactics, they decide to fight together. Determined to break up the family one way or another, they agree that their quickest route is through divorce. By joining forces though, they’re guaranteed to form a real alliance, and the promise of a happy ending is another reason why I enjoyed this movie. Look, I like it when kids who don’t like each other end up liking each other. It’s predictable but it makes me smile, and dammit, that’s what I want in my lazy weekend entertainment. Posted in USA, Western movie reviews and tagged comedy, family films on February 24, 2019 by limmer13. 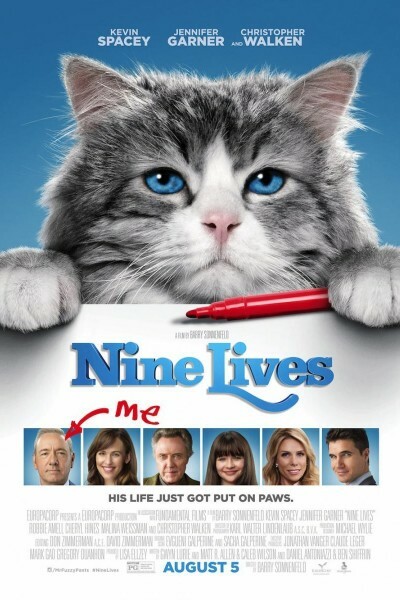 Nine Lives could be a great children’s movie. A selfish workaholic reflects on and atones for his behavior after a freak accident puts him in a coma but traps his consciousness in a cat. Though snarly in his new feline form, he comes to understand the hurt he has caused his family and learns that he may be condemned to eating fish paste and peeing in litter boxes for the rest of his life. Whether you like talking animals or a redemption story or Norwegian forest cats, there’s something for everyone in the family. But it’s hard to enjoy this movie because of, yes, star Kevin Spacey. His presence is enough to put off many viewers, and they’re not wrong for it. Watching his character, Tom Brand, manipulate those around him and then try to win their forgiveness is sickening, and I found it impossible to separate Tom’s misdeeds from the actor’s own criminal behavior. It’s especially painful to see his family try to win his love again and again. Tom’s daughter, Rebecca (Malina Weissman), is about to turn eleven, that perfect age before puberty when a girl still adores her parents. Never mind that her father practically lives at work and is more concerned with building North America’s tallest skyscraper than he is with celebrating her birthday and getting her the cat she really wants. When fate intervenes and lands him at the doorstep of Purrkins Pet Shop run by the eccentric Felix Perkins (Christopher Walken), he reluctantly gives in and splurges on one Mr. Fuzzypants, who’s already used up seven of his nine lives. Instead of heading home for Rebecca’s party though, Tom goes back to work and checks in with Ian (Mark Consuelos), a manager at his company who informs him that his building will not in fact be the tallest one in North America, or America for that matter. They fight on the rooftop during a storm, and really, everyone deserves what they get. When Tom comes to, he finds he’s now Mr. Fuzzypants and that Mr. Perkins can communicate with cat-kind. He also learns that he has just one week to set things right with his family if he does not want to spend the rest of his life on all fours. Too bad he’s been a jerk to everyone. His wife, Lara (Jennifer Garner), and his son, David (Robbie Amell), from his first marriage somehow see past Tom’s sins. This is an abusive relationship, full stop. He neglects Lara and belittles David, and yet they constantly feel the need to earn his love. David, who also works for his dad, gets it worse; it’s as if Tom delights in humiliating his son, using his behavior as an excuse to boost his fragile ego. The film would still need tweaking even if we’re working on the assumption that we’d recast Spacey’s role. The only reason that Nine Lives is watchable now is its robust cast, sans its lead. Garner and Cheryl Hines, who plays Tom’s first wife, complement each other, playing supportive friends rather than two women bickering over a bad man. I also enjoyed Weissman’s warm and honest performance. Jessica loves with such conviction that I’m willing to give her the benefit of the doubt no matter how wrongheaded I think she is. Then there’s Amell, who comes at you with a look of utter dejection and some Chris Pine blue eyes. As hard as the actors try, however, they are limited by their narrow roles. There’s nothing redeeming about Tom, and it’s hard to see why anyone ever like him. I wouldn’t mind a more sympathetic though still flawed lead. The effects could also use some work. Mr. Fuzzypants, or the cats who portrayed him, are fluffy and adorable, and the special effects used to nail down certain sequences will make younger kids squeal. Tom’s office space and his new skyscraper are pitiful though, an embarrassment of green screen. It looks like the budget went into cats and Lara’s gorgeous flat and nothing else. I imagine Mr. Perkins, for example, has a delightfully weird shop, one which we get just a few glimpses of. A little more money in that direction could only add to this familiar but imaginative tale. Posted in USA, Western movie reviews and tagged comedy, family films on February 23, 2019 by limmer13. I don’t know if it’s my nostalgia for the chirpy rodents or just my eroding standards, but I’m always game for a Chipmunks movie. My contrarian’s take is that the two previous films hit their marks despite tonal issues and some uninspired acting. At least they managed to please the kinds of folks who enjoy watching adolescent chipmunk antics, that is the under-10 crowd, and me. But the return of Alvin, Simon, and Theodore (Justin Long, Matthew Gray Gubler, Jesse McCartney) for a third adventure is a strained effort. It has a few tricks but lacks that secret ingredient to make it worthwhile. The whole crew, including Chipettes Brittany, Jeanette, and Eleanor (Christina Applegate, Anna Faris, Amy Poehler), are vacationing aboard a Carnival cruise before heading out to an international music awards show. They can’t make it past one day before getting into trouble, however, and naturally, it’s Alvin who stirs things up and takes everyone down with him. 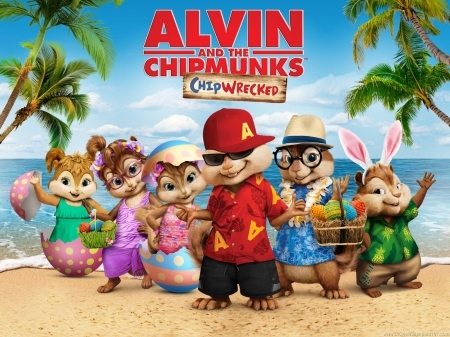 After a kiting accident, all six chipmunks end up stranded on a deserted island, wondering if dad Dave (Jason Lee) still loves them enough to come to their rescue. Chipwrecked allows the adult of the group, Simon, to shine but does so by turning him into the irresponsible one. A spider bite changes his personality and causes him to morph into Simone (Alan Tudyk), a feisty daredevil with little regard for Alvin’s now cautious ways. It’s fun to see Simon let loose for once and turn the tables on his older brother. Alvin, whose antics earlier in the film landed Simon into some trouble at the casino, gets a taste of his own medicine and goes into a panic when Simon plunges off a cliff for a swim. With no one else to rely on, he must find a way off the island or, better yet, find Dave. At last, the most mischievous chipmunk matures, if only for a while. Sadly, the film doesn’t really involve the rest of the gang. I was disappointed that Theodore, the most adorable chipmunk in the world, is left out of the adventure. Though he has a weak storyline about overcoming his fearful nature, he’s not much more than a fawning sidekick to Simon, someone who will tag along on his brother’s extreme sports tour. The same is true for the Chipettes. They add to the number of talking animals on screen, which is great if that’s what you want, but they are limited by their role as the female counterpart. Brittany lends a hand to Alvin, Jeanette struggles to understand Simon’s affections, and poor Eleanor hobbles one step behind. Still, I’d prefer a dull Chipmunks-only production to one with human characters. I’m not sure why these movies still feature Dave and former manager Ian (David Cross), both of whom actively detract from the film. At the very least, recast Dave, who could be a great addition if he were played by someone who cared about the role. Lee looks utterly bored and doesn’t even deliver the bare minimum emotion. All he can muster is his character’s angry dad scream whenever Alvin gets into trouble. In one of the film’s sweeter moments, Theodore gives Dave a necklace to wear throughout the trip. It’s edible and ugly but made with so much love. Lee registers some embarrassment but shows none of the tenderness you’d expect from a caring father. Then there’s Cross, who fares slightly better just because he plays the villain. Ian is still being punished for his previous misdeeds and, as the cruise’s security monitor, is condemned to wearing a pelican costume for the film’s entirety. He’s slightly more tolerable in this film because he’s not causing all the problems, but his smarmy attitude still makes me want to throttle him. Jenny Slate is a new addition as Zoe, another castaway who befriends the Chipmunks. Of the three humans, she gives the most dedicated performance, but even she looks like she’s just tolerating this ordeal. And not to pile on, but Chipwrecked doesn’t address the previous films tonal problems either. The movie is armed with a good message about trusting kids to make responsible decisions, but it’s not clear who the audience is for this. Very young children who might appreciate a chipmunk movie aren’t going to get the numerous Castaway references and suggestive jokes, and the older set who could get on board with the independent-minded chipmunks aren’t going to want to watch them. It’s what happens when you throw every idea into a script, hoping something will stick. High School Musical 2 doesn’t soar to the heights of the original film, but it features my favorite song in the series (“I Don’t Dance”), so there’s that. The story moves from Albuquerque’s East High to a nearby golf course as summer vacation begins and the students are in need of summer jobs. Most of them are anyway. 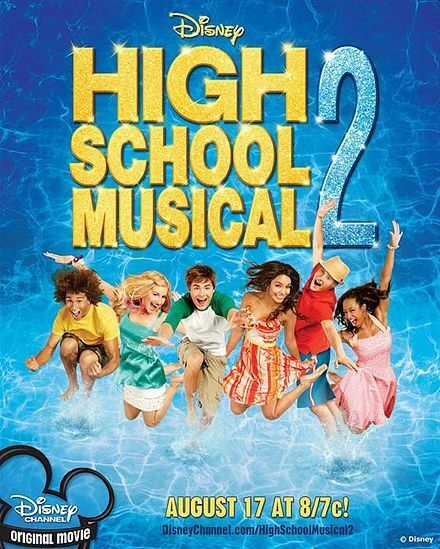 Twins Sharpay (Ashley Tisdale) and Ryan (Lucas Grabeel) don’t need to work because their family owns Lava Springs Country Club, and, operating on home turf, they get to exact some revenge after their last high school musical humiliation. It’s a story whipped up to keep the HSM momentum going. Sharpay wises up to the fact that Troy Bolton (Zac Efron) is a snack, him being a basketball and theater star now, and makes it her goal to steal him away from Gabriella Montez (Vanessa Hudgens). She gets the club manager, Mr. Fulton (Mark L. Taylor), to hire him and only him on for the summer, so she’s surprised when half her school shows up, ready to start as Lava Springs’s newest employees. The movie is a fun-in-the-sun kind of picture, something along the lines of a 60s summer beach musical aimed at the teen set, except we’re in the middle of New Mexico. The East High students are doing hard work as dishwashers, lifeguards, and desk attendants, but trouble’s brewing since Mr. Fulton’s being a jerk about his three strikes policy and Sharpay is undermining everyone in order to win the club’s talent show. Pitting the diva against everyone else weakens the narrative though. Sharpay demands to be seen and heard at all times, but she isn’t a strong antagonist as much as she is a loud one. In the first film, she’s one of many people keeping Troy and Gabriella apart, her ego and petty obsessions making for a satisfying subplot. In this story, her character has to carry a lot more baggage, but her incessant chatter soon becomes background noise to everyone else’s more interesting problems. Troy, for example, has college on his mind. He took the job to earn some money, but he also hopes to play basketball at university. Gabriella, meanwhile, is not as wrapped up in her post-East High life, probably because she’s a genius and knows she’s getting into college. She is worried, however, about her relationship with dreamboat Troy. I have said it before and I will say it again – that Efron kid can act, and while he might overdo it a bit here, he gives his character surprising depth. It’s not often I side with the preppy white boy in a movie about teenage angst, but I am swayed by Troy’s earnestness. The kid looks like he’ll break if basketball and true love don’t work out. I wish Hudgens had similar opportunities with Gabriella. Unfortunately, her dilemma is a romantic one, which means we just see her lamenting over Troy’s possibly betrayal. The best performance and character in my book belong to Lucas Grabeel as Ryan. Despite playing second fiddle to everyone, Ryan makes the most of what he’s got. If the original movie was about defining yourself and showing some moral fiber, then he owns that message here. That’s why I like his showstopper, “I Don’t Dance,” so much. Finally, he stands up and challenges everyone to let go of stereotypes about themselves. Sure, he wants them to sing in the contest as well, but for once he’s not under his sister’s orders. Also the song sounds like late-90s boy band on Broadway and is choreographed like an extra scene in Damn Yankees. For musical nerds, this one is the only memorable number. Efron’s emo “Bet On It” gets an honorable mention, but that’s because it’s grown into its own thing. I can’t name any other song in this movie, except to say there’s one for when they’re out for summer break, one for when they’re dancing in the kitchen, and one for the end of the movie. Posted in USA, Western TV reviews and tagged Disney Channel, family films, musicals, teens, TV movie, Vanessa Hudgens, Zac Efron on February 21, 2019 by limmer13. There are a few cultural milestones that I missed out on by half a generation. Harry Potter is one, another is High School Musical, and while I caught up with the former ten years ago, it wasn’t until today, now, that I finally saw the movie that kicked off Zac Efron’s career. To paraphrase Gabrielle Union in 10 Things I Hate About You – that is, my generation – I’m underwhelmed. But I’m also not a tween in 2006, and this film is fine for the youths then and now. The movie has a great message about doing what you love and not being defined by others’ expectations. If you’re a basketball player who loves to bake or a skater dude who plays the cello, then own it. Also if you’re into early 2000s fashion or you sport that shaggy haircut that Efron and co popularized, do that too. I’m not even being sarcastic about it and am in earnest when I say that kids should pursue whatever makes them unique and that the adults in the room should encourage them. If that message comes through best in the form of a cheesy Disney Channel musical, then fantastic. The movie isn’t even a bad one; it’s just not my taste and doesn’t expand its appeal beyond the tween crowd and those who would watch it for nostalgic reasons. Hairspray, for example, also centers the teen experience and features Zac Efron but is as rousing and as knotty for adults as it is for younger audiences. HSM sticks to a clean plot and prefers characters drawn in broad strokes, a fun romp about good kids trying to behave better. There’s an upbeat soundtrack to move to, with a mix of flashy numbers and romantic ballads. Plus there’s basketball and school cafeteria choreography, which I generally approve of because life is short. With a Grease-adjacent vibe, the film tells a story about Troy Bolton (Efron) and Gabriella Montez (Vanessa Hudgens), who meet in the teen lounge at a ski resort over winter break only to discover they are classmates once school starts again. Troy is the star of the basketball team and a living god at East High in Albuquerque. The school depends on his basketball prowess to function, which is why things get thrown out of whack when he decides to audition for the spring musi-cal. His winter crush, Gabriella, has just transferred and they can both sing, so why not? For her, trying out for the musical is not really an existential crisis. Gabriella is super brainy and though she’s a match for the the scholastic decathlon team, she wouldn’t mind stretching her talents if she could just get over her fear of performing, to which I say good for her. Gabriella is someone I would have identified with as a kid. I admire the fact that she has fears about fitting in and trying new things but is still fearless when it comes to pushing herself. Troy, on the other hand, is boxed in and feels like he has to choose basketball or music. And it’s no wonder because America is obsessed with school sports. Having been abroad for many years, I’d forgotten how much American schools shape their identity around sports and athletes, and it is weird. Troy feels pressured by his selfish teammates, especially best friend Chad (Corbin Bleu), who will not stop hyping The Big Game. Even worse is his meathead coach and dad, Jack Bolton. (Bart Johnson). He will make sure his team wins but only if they think about nothing but basketball. The adults really are not to be commended here, and I’m not keen on Ms. Darbus (Alyson Reed), East High’s drama teacher, either. She earns some good will for declaring that the “most heinous example of cell phone abuse is ringing in the theatre,” which, next to texting while driving, is true. She also knocks the society’s sports fixation and won’t budge in her defense for arts education. But a bad teacher is a bad teacher, and she only cares about students who already like theater, like the insufferable twins Sharpay (Ashley Tisdale) and Ryan (Lucas Grabeel). I actually like those characters and think they’re just the drama queens this movie needs. They’re insufferable and arrogant, they bully the sweet student composer, Kelsi (Olesya Rulin), and they try to sabotage Troy and Gabriella’s audition, but their over-the-top sass keeps the film from drowning in sap. *The fans will remind everyone that Drew Seeley does the singing for Troy Bolton on most tracks. Zac Efron sings in the other films. 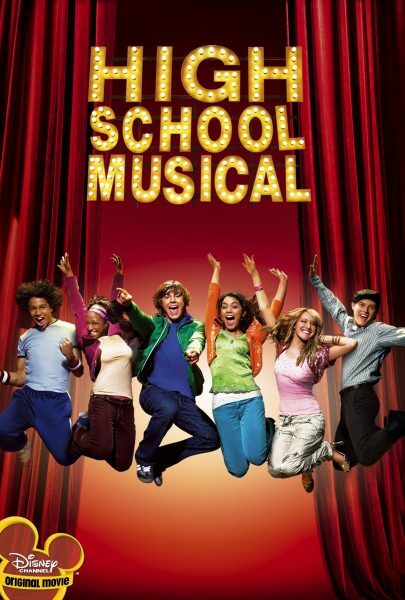 Cast: Zac Efron, Vanessa Hudgens, Lucas Grabeel, Ashley Tisdale, Corbin Bleu, Monique Coleman, Joey Miyashima, Bart Johnson, Oleysa Rulin, Alyson Reed, Chris Warren Jr.